At the beginning of the new year, E-Techco(Qianhai AnyCheck) intellectual property right made new achievements, got 14 newly authorized patents, including 1 invention paten since February. The newly authorized patents refers to smart sea rescue system, individual digital system, gait information collection wearable instruments, multi consultation apparatus, wearable paster injection apparatus, smart device for monitoring the attacker position, military first aid device, which occupies the technology commanding elevation point, lays solid technology safeguard for the implementation of military and civil integration. According to the report of PLA newspaper, under the personal guidance of the central military committee chairman Xi Jinping, military and civil integration has been our national policy, the central military committee affiliates and the relevant national committees (10 committees) issued the notice of “the determination of grandly promoting the deep integration of biomedical technology”. In spite of the world leading patent technology and talents advantages, E-Techco will get great development opportunities. E-Techco (Qianhai AnyCheck) will got sound development in the process of serving and supporting the army reform. Intellectual property is the intangible asset for the company’s growth and expansion, as the leading domestic and overseas high-tech enterprise in the area of “internet + medical + health management + geriatric nursing service”, E-Techco(Qianhai AnyCheck) has upheld the way of “technology leads, innovation propels” for a long time, and attached great importance to the accumulation and protection of intellectual property. Since its establishment, E-Techco has made a complete intellectual property strategy in a prospective view. For many years, in the support of high executives’ smart decisions and the entire team’s endeavors, and in the means of technology innovation, technology development, technology accumulation, E-Techco made use of intellectual property and its properties, adopted the attack and defence integrating pattern, achieved exceptional advantages in the intellectual property area, provided strong safeguard for expanding domestic and overseas market and the core competitiveness. The company latest intellectual property right data shows that, as of February 16th, 2016, E-Techco has applied 1091 all kinds of intellectual property, including 822 applied patents, including 231 invention patents, 279 new utility model patents, 66 appearance patents, 246 international patents(in the form of PCT), 100 software copyrights, 29 domestic and overseas trademarks, 7 domestic and overseas domains, 40 domestic and overseas authentications, 13 third party technology advancement certifications, 78 published papers. 389 authorized intellectual property rights, including 194 intellectual property rights authorization, 38 software copyrights, 16 trademarks, 7 domains, 40 international certification, 13 third party technology advancement report. E-Techco (Qianhai AnyCheck) intellectual property technology area covers Bio-IT, O2O medical service, internet hospital, chronic diseases management and intervention service, internet geriatric nursing service and science technology innovation, military civilian integration. Those R & D and innovation fills the scientific research gap in the relevant area, takes the first chance of development in the world niche market, and get high recognition and support of the science community, health community, geriatric nursing service industry, relevant government departments, also got favors and pursuits of medias, international cooperators and capital community. In order to praise E-Techco Group’s contributions in technology innovations, Shenzhen Municipal Intellectual Property Bureau awarded E-Techco as the third place in its recently published 2014 annual Shenzhen intellectual property work advantage 20 list. 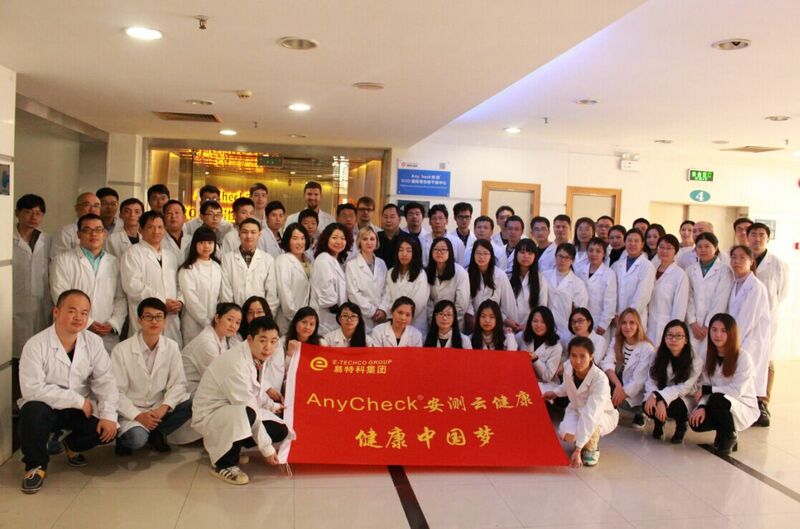 E-Techco ( Qianhai AnyCheck ) is the domestic and overseas leading health management service practitioner, it is the first full license internet health service practitioner in the internet + medical area, continuously lead the industry to develop in technology innovation, service innovation, management innovation, operation model innovation, etc. In 2015, its operation revenue exceeded 900 million RMB. Currently, the products covers software, hardware, platform, service areas, including the self developed AnyCheck APP which downloads has surpassed 28.31 millions, the registered customers reaches 7.96 millions, ranks in the front in the national health APP ranking list published by the authoritative organizations. In the mean time, the group always adheres to do internet using the industry and commerce method, possesses and operates a class 2 hospital, has 12 O2O physical stores , 24 community hospitals, 3 old cadre sanatoriums, which closely integrating the online medical service. In recently years, through the unremitting efforts and endeavors of the R&D team and the entire team, E-Techco (Qianhai AnyCheck) has gained “national postdoctor scientific research station”,” High-Tech Enterprise”, “software enterprise ”, ”Guangdong Province internet medical engineering center”, “Guangdong Province Big Data Comprehensive Health Management Service Platform and R&D Application Demonstration Base”, “Shenzhen postdoctor innovation and practice base”, national ” Enterprise Credit Evaluation AAA Unit”, “ISO 9001 quality management system identification”.